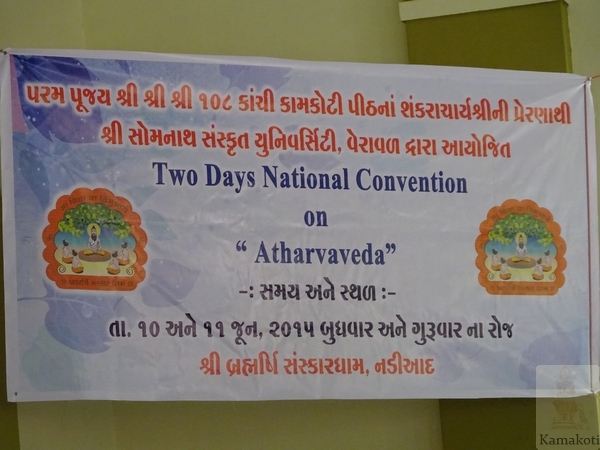 Two-day Atharva Veda Sammelan held in Gujarat -10 & 11 Jun. 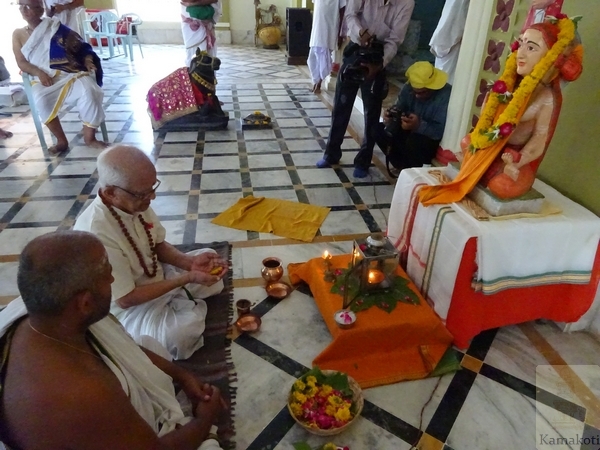 2015 Pujyashri Shankaracharya Swamigals of Sri Kanchi Kamakoti Peetam, furthering the initiatives of the 68th Pontiff Pujyashri Maha Periaval to protect the Atharva Veda from extinction, organised an Atharva Veda Sammelan along with the Somnath Sanskrit University in Gujarat at the Brahmarshi Sanskaar Dham in Nadiad. The Sammelan began with Smt. Soumya Sitaraman lighting the lamp and Brahmashri R. Krishnamurthy Sastrigal garlanding the statue of Sri Adi Shankara Bhagavadpaadacharyal. 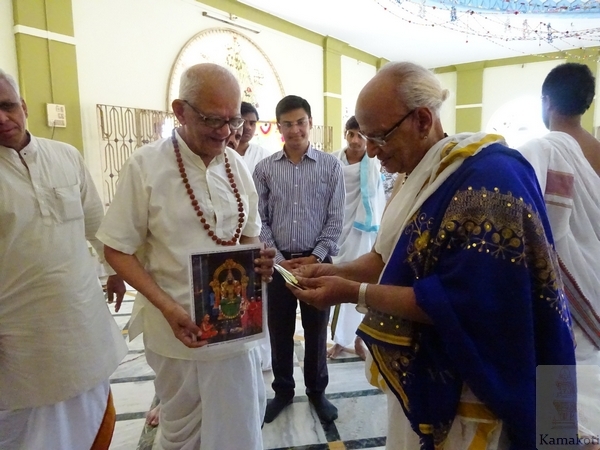 Shri Daayabhai Shastri, patron, founder and scholar of the Brahmarshi Sanskar Dham and Pippalad Shakha Atharva Vedi, who turned 90 recently, was honoured with a photo of Sri Kamakshi Ambal, a rudraksha garland and kunkuma, bhasma, akshata prasad from Sri Kanchi Kamakoti Peetam. He formally took the sankalpam for the event. Day 1 began with the chanting of the Atharva Veda. Five Pipplad Shakha pundits from Puri sat on the left and facing them were five Shounakha Shakha pundits from Dakshin Bharat and 3 from Dwaraka. 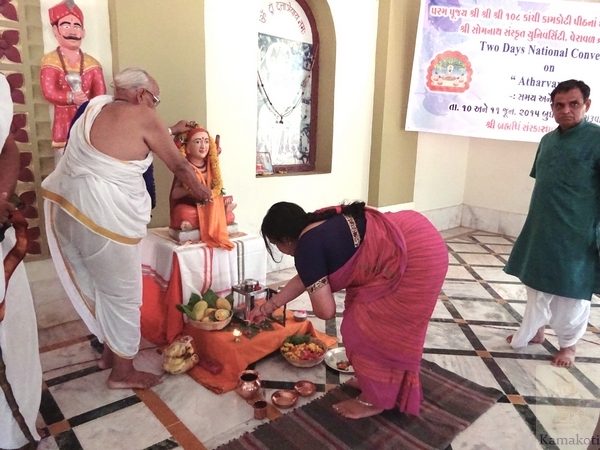 It was a tremendous historic and personally emotional occasion for the people there as the sound of both Shakhas of the Atharva Veda had not been heard in Gujarat in recent memory. 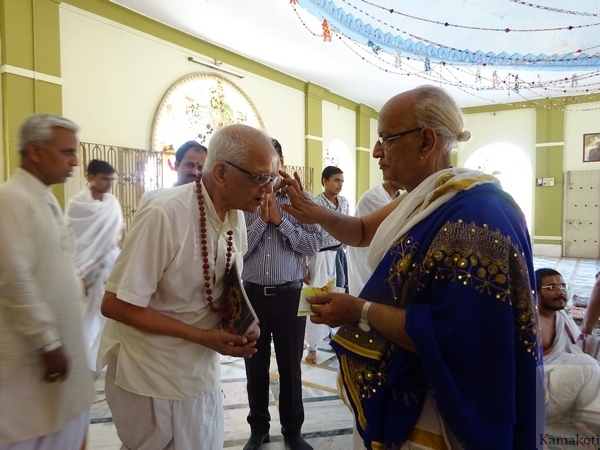 With 108 Shri's offered respectfully to the Kanchi Kamakoti Peetam's Shankaracharyas, the Somanath Sanskrit University and organised this Parayan and events at the Brahmarshi Sanskrit Dham run by Shri Dayabhai Shastri. The respect and reverence shown to Shri Kanchi Kamakoti Peetam and the thrill with which locals recall the paada yatra of our Peetadhipathi, Pujyashri Jayendra Sarasvati Swamigal was heartwarming. Naveen Pancholi Shastri was one of the original children from Mathpur village brought to study Atharva Veda by Annadurai Iyengar. The Dakshina Bharata and Gujarati Shounaka Shakha pundits sat together. In the afternoon, an Upanyaasam was conducted in a separate hall with some scholars, students and Atharva veda families from Gujarat. Mullaivasal Shri R. Krishnamurthy Shastrigal made a presentation on the Mahima of Atharva Veda and the unique mantras it has for wellness, unity and harmony. He also talked in general about the unquestionable antiquity of the Veda. On the second day, he illuminated the participants with the origins of the Pippalad shakha with details of Pippla Rishi. Dr. Mani Dravid Shastri then presented an Upanyasam on the Upanishads in the Atharva Veda. The audience heard about several rare Upanishads associated with this veda, some aspects of these and references about the Shakhas. He revealed that one text mentioned 50 shakhas and another, 9 shakhas of the Atharva Veda. Today only 2 are extant, one with swara and one whose swara is lost but is sung in a paramparic tune. Shri Bhupendrasinh Manubha Chudasama, Minister, Education Cicil Supplies and Schence-Technology honoured the evening occasion. The Minister was given the blessings of the Kanchi Shankaracharyas with a photo of Kamakshi Amman, a rudraksha mala and kunkuma, bhasma, akshata prasad which he accepted with reverence. Shri Kutumbha Shastri, Kurapati of the Somnath Sanskrit University, gave the welcome address. He stressed the importance of the Veda, especially the Atharva Veda in Gujarat and the tremendous efforts of Dayabhai Shastri to keep Vedic studies alive in Gujarat. He proposed the starting of a free hostel for youth where the Atharva Veda would be taught before and after school hours. Shri Bhupendrasinhji rose to the occasion and stated that he was neither a pundit nor a shastri. He was a Kshatriya. However, as he had the power to protect and help the pundits, he and his government were fully committed to help in protecting the Veda in Gujarat in whatever manner possible. The scholars, Shri Krishnamurty Shastri, Shri Kutumbha Shastri, Shri Dayabhai Shastri,the pundits Shri K. Seetharaman, Dvivedi, and Shri Sasanka Sekar Upadhyaya were honoured by the minister and by the organisers. Smt. Soumya Sitaraman was honoured with flowers and a shawl for her selfless service towards the preservation of the Atharva Veda.